"And next on World News Tonight, we have David Muir's exclusive interview with Presidential Candidate Mitt Romney, which is exclusive to ABC News. And David is exclusively here with us right now." "Thank you, Diane. I had the opportunity to sit down exclusively with Mitt Romney earlier today and after we admired each other's hair for several minutes, I got down to some tough and exclusive questions about his latest verbal misstep ...."
"Governor Romney, you've been criticized for making the statement that you are not concerned about the very poor because they have a safety net." "No, David, that couldn't be further from the truth. I am concerned about the plight of all Americans --- rich or poor, black or white, fat or thin, gay or straight, Yankees or Red Sox, Beatles or Stones, Twitter or Facebook, Ginger or Mary Ann. I want to help everyone!" "Governor, do you actually know anybody who is among the very poor?" "Of course, David. I'm on a first name basis with many people who are among the very poor. Not that I'd let them call me by my first name." "What do you do with your friends who are among the very poor?" "We talk, David. I want to understand the serious problems they face in their very poor world." "What it's like to play golf at a public course. Do they have to take very early tee-off times or can they sleep til noon like I do? Do they get the better caddies or do they have to take illegal immigrants who are at best marginal at helping to line up putts? And when they get picked up at the airport in a non-stretch limo, is the vodka a decent Russian or Scandinavian brand or is it Smirnoff's?" "How does it happen that you meet people who are among the very poor?" "David, you think everyone at Bain Capital has my portfolio?" 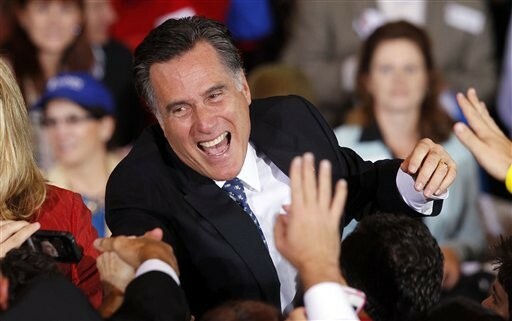 "Well, thank you for clarifying your earlier statement, Governor Romney. Out of curiosity, are you personally Ginger or Mary Ann?" "Ginger. How could you even ask that, David? In fact, I'm really not concerned about the people who are Mary Ann." "(Oh boy, here we go again!) Why is that, Governor Romney?" "Because they have a safety net." "Why, Mrs. Howell, of course!" Have you got some kind of election going on over there? Nah, Lexi, it's no kind of election at all. BTW, are you Ginger or Mary Ann? Do you know what it means?